While Tamil Nadu's Shabbir won his third title, beating Karnataka's Akaash Ashok Kumar in the final, Haryana's Anukriti won her maiden women's singles title on Saturday, February 10. 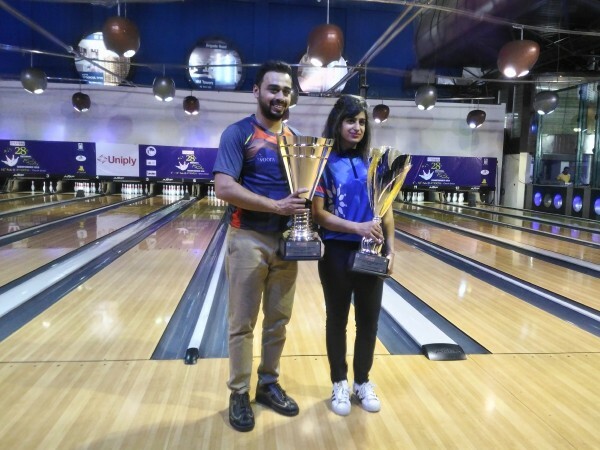 Shabbir Dhankot of TamilNadu and Anukriti Bishnoi of Haryana won national titles at the Uniply 28th National Tenpin Bowling Championships, which concluded at Amoeba, Church Street, Bangalore on Saturday, February 10. In men's category, Shabbir won his third national title defeating top seed Akaash Ashok Kumar of Karnataka (486 – 474) by 12 pins. In the women's category top-seed Anukriti Bishnoi won her maiden national title defeating defending champion Sumathi Nallabantu of Telangana (460 –360) by 100 pins. Earlier in the day, in the stepladder round, played based on cumulative pinfall of two games, in Match 1 of men's category, third placed S A Hameed (Delhi) lost to fourth placed Shabbir (475 – 444) by 31 pins. In Match 2, Shabbir beat defending champion Dhruv Sarda (Delhi) (486 – 460) by 26 pins. The Tamil Nadu bowler was trailing by 14 pins at the end of Game 1 but scored 3 strikes in a row to end Game 2 with a score of 264 as against 224 of Dhruv and moved to finals. In Match 1 of the stepladder round of women's category, second placed Sumathi comfortably beat third placed Anuradha Sarda (462 - 399) by 63 pins to move to finals against Anukriti. In the men's category, Akaash (6735 pinfall & 210.447 average) finished at the top position after 32 games, followed by Dhruv (6630 pinfall & 207.19 average), Hameed (6568 pinfall & 205.25 average) and Shabbir (6347 pinfall & 198.34 average) and qualified for the stepladder round earlier. In women's category Anukriti finished at the top spot (3478 pins at 173.90 average) after 20 games after Round 2, followed by Sumathi (3455 pinfall & 172.75 average) and Anuradha (3388 pinfall and 169.40 average) at 2nd and 3rd positions respectively.